As an Aboriginal Australian, Julie understands some of those things which hinder Aboriginal Australian people from living their dreams. 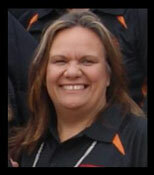 AusCoaching was established to provide coaching services to other Indigenous Australians. As an Indigenous, Professional Coach Julie offers culturally appropriate, qualified coaching for Indigenous executives, individuals, women in and of leadership and business. Additionally, AusCoaching provides you and your organisation with culturally appropriate facilitation and scribing services.